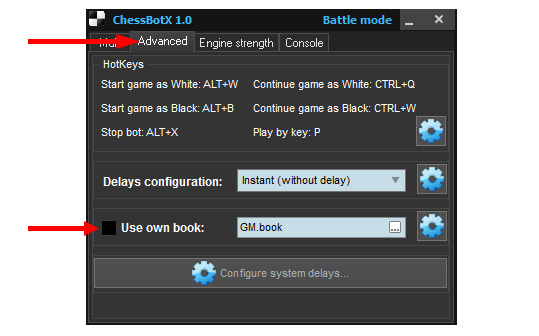 Chess bot can use opening books. There are 2 own opening books available in the downloaded package: Basic.book and GM.book. These books are pretty simple and not very strong. They designed only to widen debut repertoire of the bot and achieve a more human-like play. So if you want to use own book, just turn on "
Also you can use ".bin" books, which provided with some engines like Komodo or Brainfish. In that case you need to configure engine settings and specify path to such book. 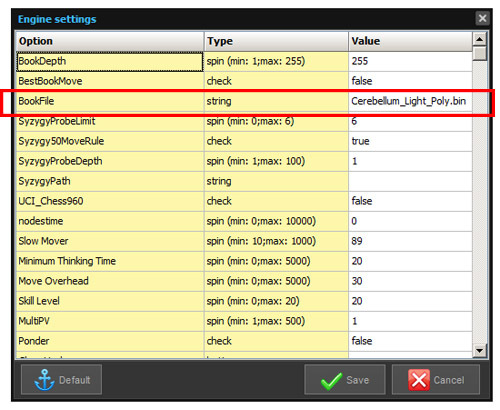 "Use own book" checkbox on "Advanced" tab, otherwise internal book will override moves of engine's book! Please note that for different engines settings may differ, for example in Komodo engine you should also set "OwnBook" value to "true", besides specifying the path to the book. 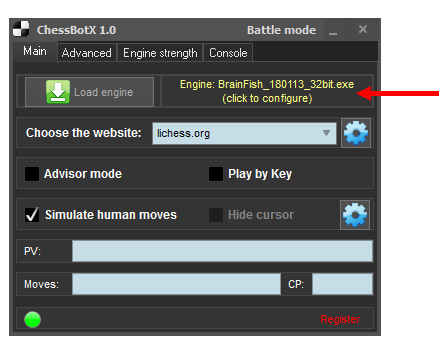 Please refer to chess engine's documentation for exact instructions.